If you don’t have the luxury of living in a warm climate year around or have a suitable yard to house your turtles or tortoises in an outdoor turtle pen, you will likely need to house them indoors permanently or for a few months over the winter. Many fully grown healthy turtles can be housed outdoors year around since they can hibernate during the cold months when temperatures drop into the 50s. Young juvenile or sick turtles and tortoises shouldn’t be left outside during cold days or allowed to hibernate; especially if they tropical species or originally from warmer climates. Additionally, small turtles and sick turtles are more at risk of being killed by predators or illness. Therefore, it’s a good idea to setup a turtle habitat indoors where you can better control the temperature and humidity. For non aquatic species like box turtles and tortoises should never be housed in a glass vivarium or turtle aquarium. The glass walls of these tanks make it difficult to create a temperature variation needed to allow a turtle to thermoregulate. The glass helps trap the heat inside the tank and raises the inside air temperature to unhealthy levels. The transparency of the glass walls can also stresses out your pets as they will continue to walk through them to get out. Finally, you should avoid using a glass vivarium because they usually have poor ventilation and lead to higher rates of respiratory problems, lumpy shells and accelerated unhealthy growth. The best solution for housing your turtles indoors is a turtle table. These tables can be bought through manufactures, custom built from scratch using building materials or items found around the house can be converted into a table such as an old book case or a large plastic storage bin. 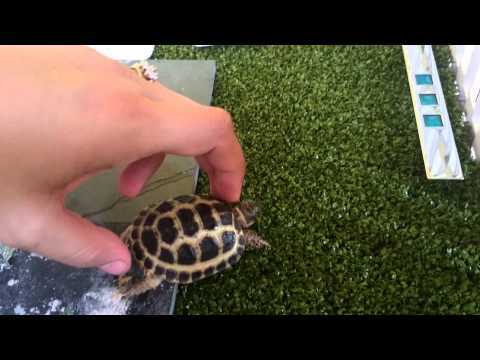 The benefits of a custom built table can take into consideration the needs of your pet turtle. For one, the floor space can be maximized to allow your turtles to have enough room to get the exercise it needs to stay healthy and to give it some personal space (lower stress) if housed with multiple turtles. In addition to those health benefits, the open top of a turtle table will ensure your turtles and tortoises receive plenty of clean fresh air as well as allowing any poor quality air to dissipate more freely. Turtles and tortoises need (ultra violet) UV-A and UV-B light to stay healthy. UV-A is the same type of light that allow plants to grow. This lighting also stimulates the appetite in a turtle since it makes their food appear more natural. UV-B on the other hand helps in the synthesis of vitamin D and the absorption of calcium in the body. A good way to provide both of these types of lights is to get a two bulb light fixture that you can hang on a board or from a chain about 16-18 inches above the substrate. In most cases, one of these will be suitable unless you have an above average table size and in that case, two or more might be needed. UV-B lights lose their efficiency overtime so you should change the bulbs every 3 months if you have growing turtles and 6-9 months for fully grown ones. You should put the lights on a cycle of 12 hours on 12 hours off. Buying a timer makes doing this easy. Tropical tortoise breeds don’t particularly like bright light and don’t require high intensity UV-B light. Tropical species can be fed a diet that include prey or carrion rich in vitamin D3 or oral supplements. There are mercury vapor light bulbs that provide UV-A and UV-B and a good source of heat. You can find these lights and other lights suitable for turtles at pet stores in the reptile section. However, if you don’t have a particularly large turtle table, you should avoid getting a powerful light that puts off a lot of heat since it will be hard to create different temperature variations. Depending on your turtle’s habitat requirements you will need to create a temperature variation anywhere from 70*f to 95*f. Box turtles and tortoises enjoy basking under a heat lamp but you can also add heat by using some sort of heating pad that can be placed underneath your turtle’s tank. Heat lamps and overhead ceramic heaters need to be installed with care and made sure they are not resting on or close to any flammable materials. During night periods, a ceramic heater can supply long wave infrared heat without emitting any light. If you have box turtles or a tropical tortoise like the red footed tortoise, these will need a living space that has high humidity. The inside of a house usually has a much lower humidity than what your pets will require. To raise the humidity of their living space, you can modify your turtle table by doing a few things. The first thing you can do is buy a warm air humidifier and attach it to a ventilation tube that drops into your turtle’s living space. You can run it constantly or add a timer to have it run every few hours. This will make the water in the tank of the humidifier last longer and not require you to refill it as often. Next you should partially cover the top opening of the table with a sheet of twin walled polycarbonate or another type of plastic to keep the moisture from evaporating. Finally you can add extra watering dishes or live plants. Live plants not only help increase humidity, they make the habitat look more natural (see the list of plants to avoid). The best substrate for an indoor turtle table is one that you can easily change when soiled. Avoid using soil and in stead use coconut fibers or ground bark from fir trees. Pet stores offer a range of suitable options. For Box turtles and tropical species, these types of substrate are ideal since the absorb and hold moisture well. For tortoises however, you should use a sandy soil that stays dry. You can use things like seed trays to create substrate sections that can be easily removed and cleaned. All turtles and tortoises need a source of water to drink from even the desert tortoise species who don’t normally have access to water all the time in the wild. The best water dishes are those that your turtle can get into and take a soak and have a drink. These only need to be a few inches deep or not so deep that your turtle can’t easily stand in with it’s head well above the water line. The instruction for this table is intended for tortoises or turtles that prefer a dry environment. Additions can be added to this basic setup to provide an adequate home for box turtles, semi aquatic Asian species or tropical tortoises who require higher humidity and or a larger source of water. To build a table that is 4 x 8 feet (1.22 x 2.44 meters) and 18-24 inches high (46-61 cm) you will need four boards of wood, a sheet of plywood, metal L brackets, aquarium sealant and a water proof finish. The boards should include two pieces that 8 feet long, 18-24 inches high and 1 inch thick; the other two boards should be 4 feet 2 inches long, 18-24 inches high and 1 inch thick. The plywood base should be a sturdy 8 x 4 feet sheet. The brackets should be the appropriate size to properly secure the walls and the screws should not be too long that they run through the other side of the 1 inch thick boards or plywood base. Place the plywood sheet flat onto the surface you want to build the table on and then place the first 4′ 2″ up against the short side of the plywood so as to add the first wall. Don’t place the board onto the plywood but instead right up against the plywood. Make sure that each end of the wall sticks out past the plywood base by an inch. A few inches from both ends of the inside of the first wall, add L brackets. One edge of the L bracket should be flat onto the plywood base and the other up against the inside of the 4′ 2″ wall board. Do the same for the other short wall and then add the 8′ long walls. Work them in so they are butted up against the plywood base and up against the short walls so they flush with them. Secure the long walls with L brackets and add extra ones in the middle of the 8 foot walls if needed. Use a water proof, non toxic finish to paint the entire tortoise table, both inside and out. Use an aquarium sealant to run a bead along the four corner joints and along the plywood floor bottom. This will finish sealing the table and help keep any moisture from rotting the wood. You can then secure two post on opposite sides of the table with a board that runs from one post to the other. Lighting and heat lamps can be hung from this overhead board. Make sure the lights and especially the heat lamps are about 16-18 inches away from the substrate (avoid fires and electrocution by using the proper lighting fixtures and wiring). Semi aquatic Asian box turtles like the Malayan and Three Striped need a much larger watering hole. In fact, the water should take up about 50% of the entire turtle tank. You can build one of these by getting a pond liner or a plastic bin about 4 feet by 3 feet and 10 inches high. Line the entire table with a water proof liner and seal it with an aquarium sealant. Then you can add the tub for your make shift pond. Fill the land area with a few inches of rock or charcoal and then about 6 inches of a sandy topsoil. In the pond place an inch of gravel on the bottom and some larger flat rocks to be used as a ramp for your turtles to crawl in and out of the pond. Make sure the rocks are secure and won’t accidentally trap your turtles. The water will get dirty fast so you will need an external box filter and heater to keep the water in the high 70s. I was only looking for what to feed turtles because i just got home from school and found a turtle in the street and i love turtles so i brought it home and it still needs a habitat and food. To see what type of food it needs, see this post on food and diet and then use some of the advice found on this post to build your turtle a new home. If you don’t think you can care for it, you should release it back into the wild. That is, only if you think it is a turtle that was wild and not a pet someone let go. Normally you should leave them alone and let them be in the wild instead of taking it home. If you decide to keep it, you may want to take it to a vet for a checkup.